The STV family of telescopic masts with winch-driven extension raises hefty top-loads in nicely man-portable and deployable configurations. Heights of 8, 10, 12, 15 and 18 meters are available in two sizes of bottom tubes. Maximum top loads of 55 lb (25 kg) to 77 lb (35 kg) can be handled depending on the model selected. Raising the fiberglass composite telescoping mast sections is made easy by a removable hand-operated winch with cogwheel transmission and strong polyester-aramide reinforced belts guided between the sections. The winch has built-in automatic safety brake to protect the operator. Comes complete with components, tools and canvas bags. 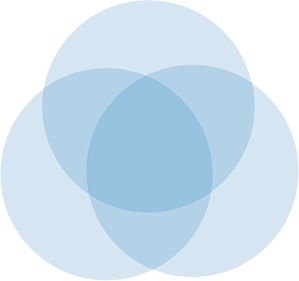 Click to see the STV deployment video. STV-G is a special version of the family of STV winch-driven telescopic masts for easier mounting inside or outside a vehicle for elevation of antennas, lighting, photography or other similar equipment. Mast sections are made of polyester resin reinforced with fiberglass tubes with durable polyacetal slide-joints. Each section has four longitudinal guideways to align the mast and enable manual rotation around its axis. The mast is raised by a hand-operated winch with cogwheel transmission and system of strong polyester belts guided between the sections. The winch has built-in automatic safety brake to protect the operator. STV-G masts are made in two versions - with 3 or 4 sections. Winch position, mast foot arrangement, top adapter diameter, height, etc. can be customized. Contact us to discuss. The RTM family of portable telescopic masts offer rapid deployment for static mobile and semi-permanent communications applications. Available in 6, 8, 10 and 12m lengths, RTM masts are made from lightweight high-strength composite material and are designed for manually elevating small to medium sized antennas up to 22 pounds in weight. Essential accessories, such as anchor pegs, base plate and guy ropes are neatly stowed on the main assembly, making the mast compact and easy to deploy. The bayonet style section locking mechanism has no exposed parts, screws or levers that could be lost or damaged during transportation and deployment. For fast and effective erection, RTM Masts feature a built in bubble level gauge, situated on top for protection and ease of use. Guy rings allow free rotation of the mast for directional antenna positioning. The base tube diameter is 4 inches, top tube OD is 1 inch. Typical deployment time is about 10 minutes. 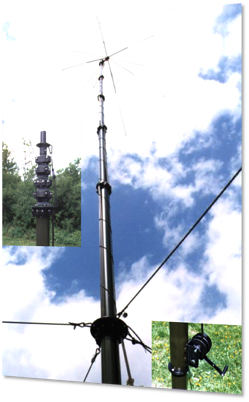 RSM-6 is a lightweight, man-portable tactical mast ideal for elevating lightweight/wire antennas up to 13 pounds for short to medium-term tactical base station or forward command communications applications. 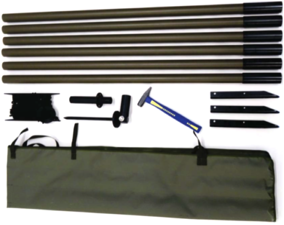 RSM-6 is packed complete with all accessories, baseplate, guy ropes, mallet, anchor pegs and carry bag, and is easily deployed in about five minutes. The fiberglass sections fit inside one another for compact storage and transport. ST-R incorporates a three-arm aluminum stay with telescopic support legs made of composite material. In normal conditions the mast is self-supporting and does not need additional ropes and anchors. ST-R mast is primarily intended for elevating and mounting light directional and omnidirectional or wire antennas on flat or inclined ground. 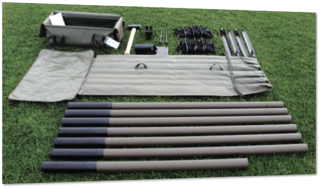 Standard mast height is 6m, using 4 sections of 1.5m each, and comes packed in a handy linen travel bag. 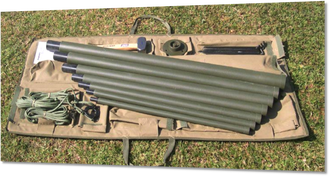 STM lightweight man-portable antenna masts are sectioned tubular structures intended for use with lightweight antennas. Mast sections are made of composite fiberglass material with UV resistant paint ed aluminium joints. All mounting accessories are included in a strong canvas carrying bag. Various options (section length, number of sections, no. of guying levels, no. of guys, etc.) are available on request. Antenna masts ST-5, ST-8, ST-10 and ST-12 form a family of light antenna masts, composed of tubular fiberglass sections. The mast stands on a tilting base fixed on to the ground with iron pegs. The mast is guyed on several levels with high quality polyester ropes. The top section is intended for antenna attachment. The masts are also suitable for different kinds of wire antennas riased by rope and pulley. The mast is packed in two transportable canvas bags. Check out the ST deployment video.